The days are getting shorter, the nights are getting longer, and the weather is getting harsher. In winter my skin always struggles, requiring more care and attention to protect it from the wind and rain. In particular I find myself in most need of better lip care to better avoid sore, chapped lips. These are my tips for protecting yourself against the harsh winter months. It’s easy to fall into the habit of drinking less in winter because, let’s face it, a cold glass of water isn’t all that tempting when it’s below freezing outside. Dehydration only makes lip chapping worse so it’s important to stay hydrated. In winter, I swap my usual glass of cold water and lemon in the morning with a hot lemon and ginger tea. It’ll help you stay hydrated, as will tea, juice, smoothies, plant-based milks, and water-rich fruits and vegetables. If your lips become excessively dry they can feel uncomfortable and become chapped. Using a scrub will help exfoliate your lips, removing dead skin cells, and keeping them in good condition. I make my own DIY lip scrub using coconut oil, brown sugar, and almond oil. Using this treatment a couple of times each week will keep your lips in top condition, keeping them soothed and hydrated while making it easier to apply lipstick and lip stains. The air in your home can become dry. Using a humidifier, if you have one, on cold days or in your bedroom at night can prevent your skin from drying out and becoming damaged. I control the heat in my home by putting the central heating on a timer to prevent overuse and protect my skin against its drying effect. Be aware of how often you put the heating on, and try to bundle up in jumpers and blankets before flipping the switch. This will ensure the air in your home doesn’t become overly dry. 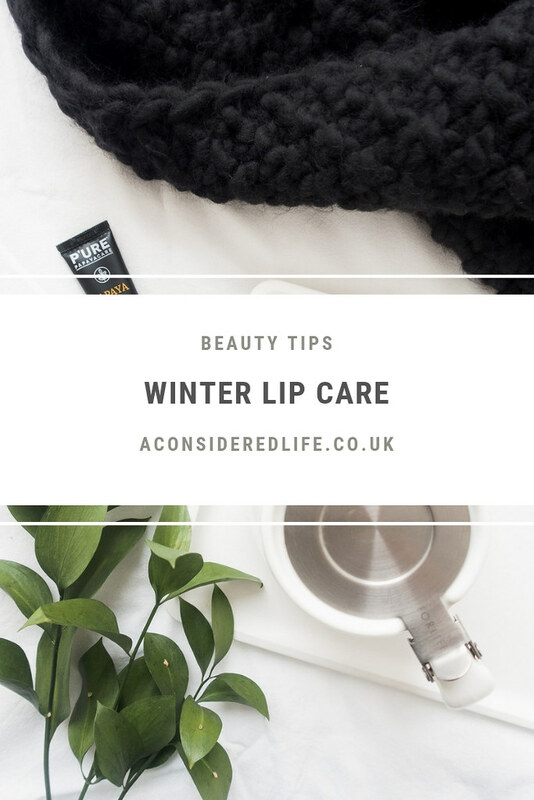 The most important role in winter lip care is applying a nourishing lip balm regularly, several times throughout the day. 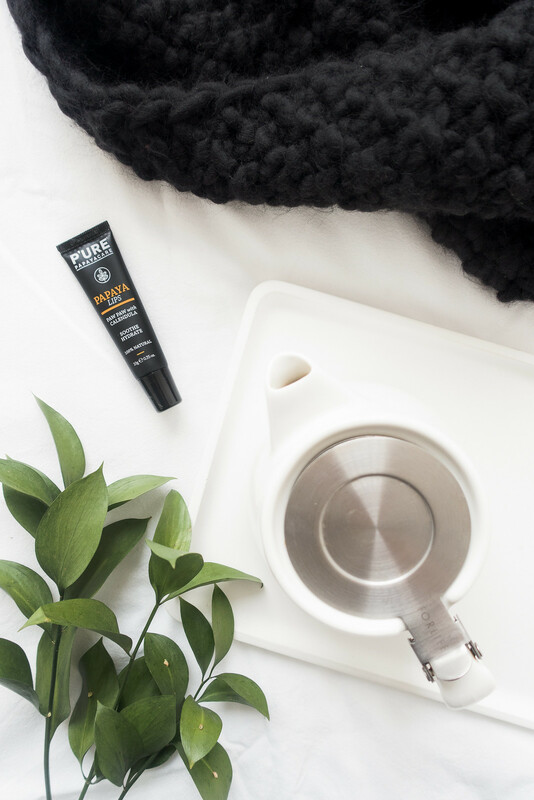 This will keep your lips moisturised, preventing them from chapping or peeling. Lately, I’ve been using a tube of P’URE Papaya Lips, available at Holland & Barratt. 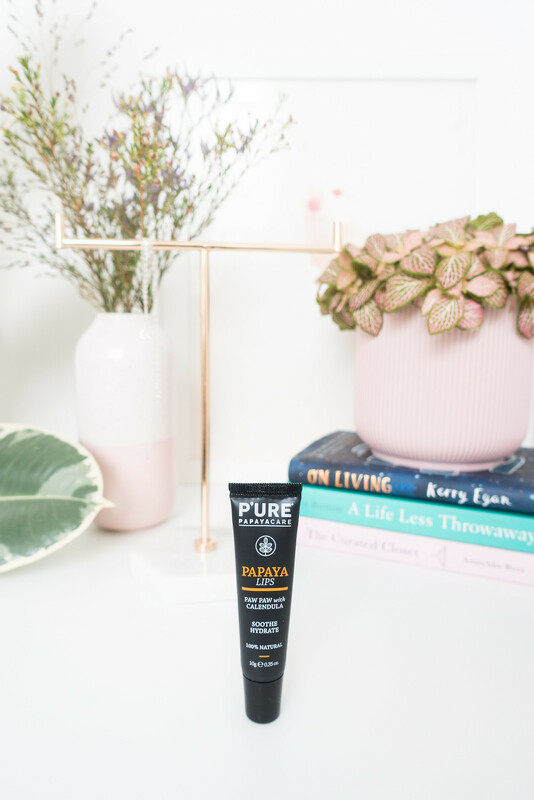 The cruelty-free formula contains 100% nature vegan ingredients including calendula, shea butter, jojoba, and macadamia oils to deeply moisturiser, soothe and hydrate lips. It’s also made using Australian non-GMO organic fermented papaya to provide a gentle exfoliating affect. 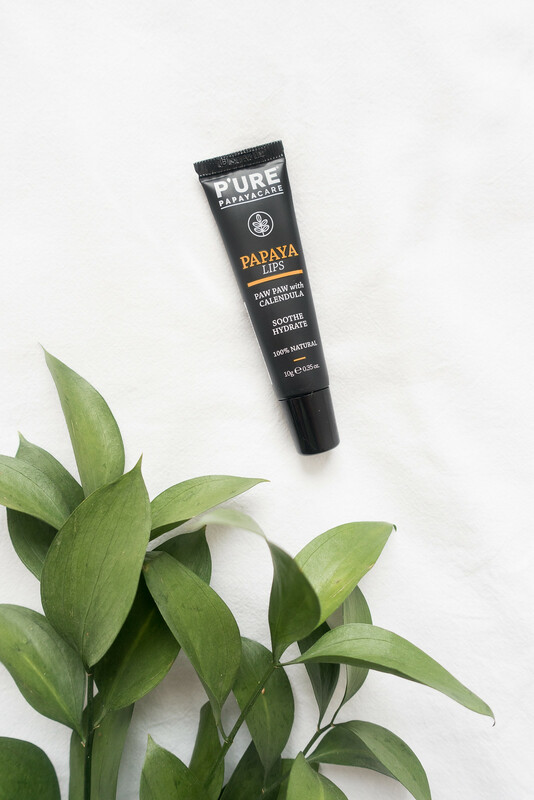 Thankfully, P’URE Papaya Lips doesn’t contain palm oil, petroleum, castor oil, phthalates, parabens, or preservatives. The balm is creamy and rich with a fuss-free applicator, making it ideal for taking everywhere with you. I’ve kept this little balm in my coat pocket or bag, and have been applying it several times daily to prevent dryness. It has a soothing effect, which is a blessing when I’m out in the cold. I’m a fan of calendula-based lip balms for their highly effective treatment for chapped lips, and this one is no exception. As much as we'd all love to stay indoors when the weather outside is harsh and uninviting, it's impossible to avoid stepping out into the cold altogether. If you do have to venture outdoors, try to cover your face to protect it against the freezing temperatures. When you’re exposed to the cold outside, use a scarf or button your coat up to cover the bottom half of your face. This will help to protect your skin against the wind, helping to prevent moisture loss and chapping. What are your winter skin care tips?